Free China has been screened on popular Ukrainian TV network http://lanet.tv/3s/ reaching millions via Cable, Satellite and online. Popular prime time TV host introduces award-winning director Michael Perlman, and main characters Jennifer Zeng and Dr. Charles Lee before the film’s screening. Michael Perlman’s new documentary “Free China: The Courage to Believe” which opens Friday in New York City for a week-long run, is a brave, upsetting, unabashedly political film that examines the dissonances between China’s remarkable economic rise and its appalling human rights record. But for Perlman and the rest of the team behind “Free China,” the film is not only about highlighting China’s humanitarian offenses–it’s about rallying the West to push for the dissemination of free information to the Communist state. “Free China,” a production of New Tang Dynasty Television and World2Be Productions, is at its core a tale story of two activists. Jennifer Zeng and Charles Lee were both imprisoned by the Chinese government for practicing Falun Gong, a spiritual practice also known as Falun Dafa that began in China in 1992. 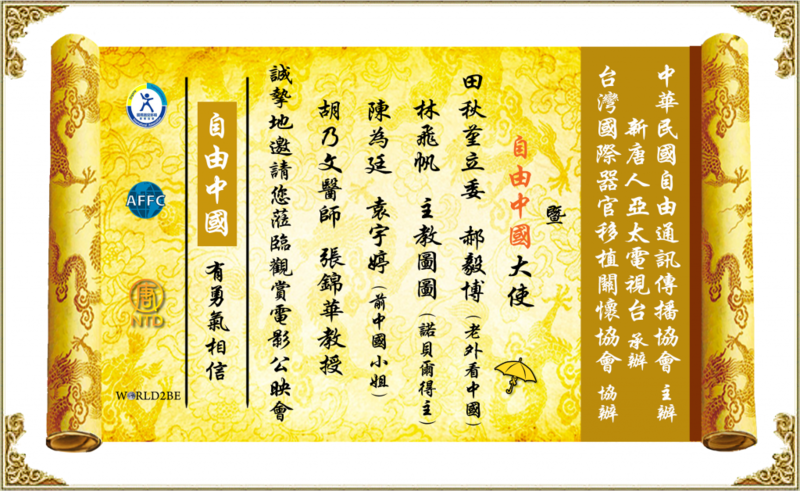 Falun Gong combines elements of meditation and graceful exercises, focusing on three central tenets: truthfulness, compassion and forbearance. Promoted by the Chinese Communist Party in the mid-90s, Falun Gong became the target of government suppression in 1999 as it its popularity increased and the number of its adherents began to rival that of the Communist Party. Documentaries that focus on political issues often straddle the narrow divide between journalism and activism, combining the evidence-based approach of reporting with the call to action of advocacy. For the most part, “Free China” finds itself on the activist side of that line, extolling the virtues of Falun Gong and the peacefulness of its demonstrators while forcefully condemning the Chinese government’s response to the movement. But there is important reporting in the film as well, especially in the form of footage smuggled out of China’s forced labor camps which documents the deprivation and mistreatment of the country’s political prisoners. These images are shocking, evocative and repellant, at times resembling some of the most inhuman atrocities committed by human beings in the last century. 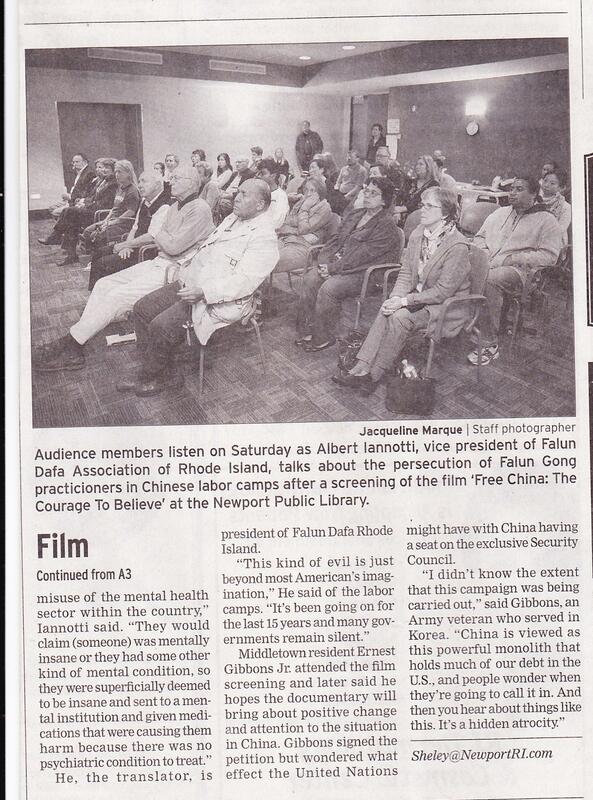 But the accounts of Zeng and Dr. Lee themselves are both the most moving and most upsetting elements of the film. Shot as simple, conversational close-ups and subtly interspersed with footage from inside China, the first-person narratives of the two activists humanize the story of China’s crackdown and anchor the specifics of real human experience. To give just one example, Zeng talks of running away from home and family just five days after being released from a labor camp, overcome with her young daughter’s school-inculcated condemnation of Falun Gong. Zeng flees to Australia, applies for political asylum and begins to write a book about her experience. The process is halting at best, she says, because any time she remembers how she renounced Falun Gong to escape the prison camp, she is overcome with shame at having betrayed her values. This, she hypothesizes, is why other Falun Gong practitioners who are oppressed by the regime do not speak out: their will broken, they are consumed by embarrassment and stay silent. Of course, Zeng does finish her book, “Witnessing History,” which goes on to become a bestseller. 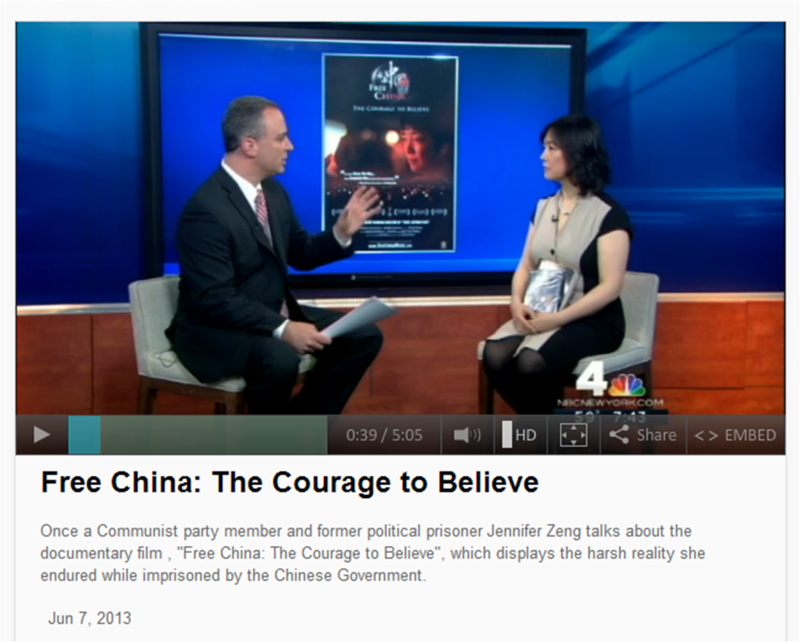 There is something deeply inspiring about Zeng’s journey–from ordinary citizen to political prisoner to apostate to activist–precisely because of the conflicting emotions she feels about her experience and the fact that she has continued to speak out and advocate for awareness and reform. Speaking at a screening in Manhattan this past Tuesday, on the 23rd anniversary of the Tiananmen Square Massacre, Zeng stressed that “Free China” should not be seen as academic or historical, but rather as a reminder of what continues to happen to this day. Yet despite its serious subject matter, “Free China” feels at heart like a positive film whose goal is to enlist the international community in a renewed push for the personal freedom and liberty of the Chinese people. During Tuesday’s screening, NTD Senior Vice President Samuel Zhou told the audience that increasing access to free information in China is already transforming the Chinese society. “This is probably the best long-term investment into the future of China’s markets,” he said. “Free China” is only one part of a possible opening up of the world’s most populous country. But it serves as a lesson that while China’s markets may have liberalized, its political system has not, leaving far too many people under the rule of an oppressive, autocratic regime. That’s something we know, but we often overlook. Jennifer Zeng and Charles Lee’s lives remind us that we have a duty to pay attention. “Free China: The Courage to Believe” will play from June 7 to June 13 at the Quad Cinema, 34 W. 13th St, New York, NY, with performances at 3:10 p.m., 4:45 p.m. and 7:30 p.m.
Free China: The Courage to Believe delivers a powerful, if at times heavy-handed, warning: The systematic and state-sanctioned persecution of peaceful citizens is alive and well in China. 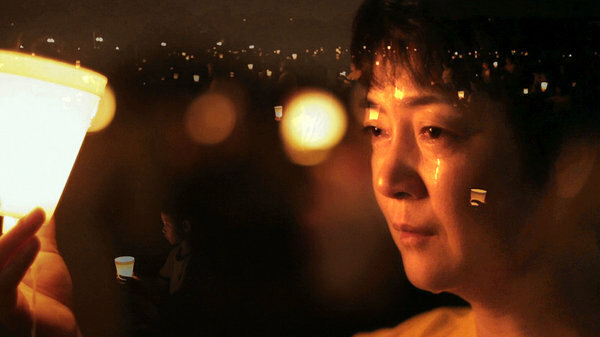 The hourlong, talking-head documentary tells the story of Falun Gong, a spiritual practice combining Buddhism and Daoism, which took China by storm in the mid-1990s. With 70 million Chinese practitioners, rivaling the number of Chinese Communist Party members, Falun Gong came to be viewed as a threat by the Communist Party regime; it was outlawed in 1999. The state began arresting Falun Gong practitioners who refused to quit or denounce their views, interning many in forced labor camps where the prisoners faced torture and, shockingly, the harvesting of their organs for transplants. Free China puts two courageous and articulate faces to the crisis: Dr. Charles Lee, who returned to his native China from the United States to help the Falun Gong cause and spent three years in a labor camp; and Jennifer Zeng, a mother, former Communist Party member and Falun Gong practitioner, who wrote a bestselling book, Witnessing History, about her year in a labor camp. Frustratingly, the film says little about the specifics of Falun Gong– from the footage here, it resembles tai chi–so a few minutes of research before viewing may be in order to fully appreciate what Zeng and Lee are fighting for. But Free China, with its aggressive narration, haunting music and disturbing photographic evidence of crimes against humanity, wants you to walk away outraged at the injustice of it all, and most likely, you will.